Everyone loves to hate meetings. But meetings aren’t all bad, and Kim and Russ have some advice for making them better. This episode starts with an interview with Claire Johnson, COO at Stripe. Claire tells Kim and Russ a story about her boss Paul asking to grab her after a meeting to provide feedback. Hey, can I grab you for a few minutes in my office? The feedback that Claire received was much more impactful because her boss gave it immediately after the meeting. Kim and Russ suggest that bosses use meetings as a feedback look-out opportunity. This week’s listener question is about a terrible meeting habit: interrupting. Kim and Russ give advice for what to do about interruptions in meetings. 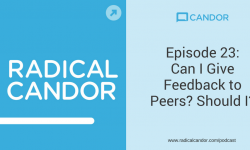 And of course, the episode ends with practical tips for meetings in the Candor Checklist. Our tips for improving your meetings — put these into practice right away! Tip 1: Have an agenda. Tip 2: Assign roles for the meeting. Tip 3: Think hard about who needs to be there. Get the details for these tips by listening to the full episode. Check out these additional posts with tips for improving your meetings. Get Radical Candor and Candor Coach! We’re excited that Kim’s book is now on bookstore shelves around the US! If you haven’t ordered your copy yet, pick one up today for everyone on your team! And if you’re interested in putting the ideas in the book and in this podcast into practice, our new app for iOS can help! Download the Candor Coach app, and let us know what you think. Android users, we’re sorry we don’t have a version for you yet, but it’s coming! Sign up here for a notification when it’s ready. 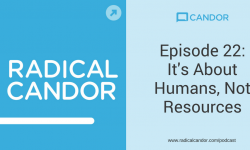 We’ll have a new episode of Radical Candor next week. See you then! 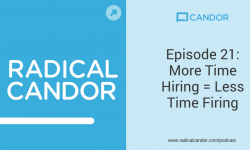 Loved this episode and plan to drive the meetings towards this streamlined/effective format. Would love to use the template, but the link to ‘meeting agenda template’ no longer works. Any info would be greatly appreciated!